After reading and writing about the anti-aging benefits of sweet potatoes, I decided to make a conscious effort to include them more frequently into my diet despite the fact that I don’t particularly like their taste. I find sweet potatoes to be.. well.. too sweet. I prefer savory for dinner, saving sweet for dessert. So creating recipes with an ingredient like sweet potatoes that I don’t use very often was initially daunting. But I quickly realized I could a lot with these sweet tubers and have since come up with a few sweet potato recipes that are healthy and very easy to prepare. I’ve even created a spicy sweet potato salad I love so much, I make almost every week and eat it as a mid afternoon snack! 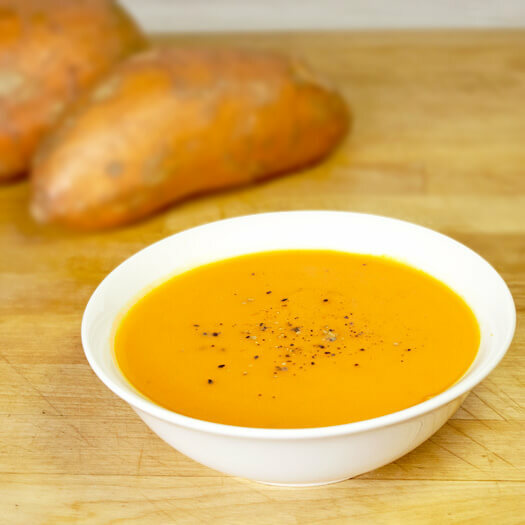 This simple sweet potato carrot soup is creamy, comforting and very satisfying. In a medium size pot over high heat, add olive oil, garlic and onions. Cook for a few minutes until onions are clear (translucent). Add chopped carrots and sweet potatoes and cook for 2 minutes. Add vegetable broth, bring to boil, cover and simmer for 30 minutes. Turn the heat off and puree the vegetables until smooth, using a blender or food processor. Season with salt and pepper. Serve.